Never use lavender on an open wound; seek immediate medical attention. In folklore, pillows were filled with lavender flowers to help restless people fall sleep. Scientific evidence suggests that aromatherapy with lavender may slow the activity of the nervous system, improve sleep quality, promote relaxation, and lift mood in people suffering from sleep disorders. Studies also suggest that massage with essential oils, particularly lavender, may result in improved sleep quality, more stable mood, better concentration, and reduced anxiety. In one recent study, people who received massage with lavender felt less anxious and more positive than those who received massage alone. Several small studies suggest that lavender aromatherapy may help reduce agitation in patients with dementia. Lavender flowers have also been approved in Germany as a tea for insomnia, restlessness, and nervous stomach irritations. Aromatherapists also use lavender in inhalation therapy to treat headaches, nervous disorders, and exhaustion. Herbalists treat skin ailments, such as fungal infections (like candidiasis), wounds, eczema, and acne, with lavender oil. 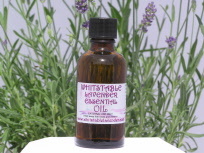 It is also used in a healing bath for joint and muscle pain. One study evaluating treatments for children with eczema founded it was therapeutic touch from the mother that improved symptoms; in other words, massage with and without essential oils (including lavender) both reduced the dry, scaly skin lesions. May be used topically in diluted concentrations to treat skin infections and injuries, such as minor cuts and scrapes.